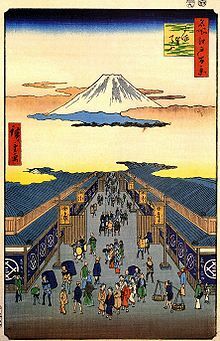 Tenna (天和) was a Japanese era name (年号,, nengō,, lit. "year name") after Enpō and before Jōkyō. This period started in September 1681 and ended in February 1684. During this time, the emperor was Reigen-tennō (霊元天皇). The nengō Tenna means "Peace of Heaven". 1681 (Tenna 1): Tokugawa Tsunayoshi is established as the fifth shogun of the Tokugawa shogunate. 5 February 1681 (Tenna 1, 28th day of the 12th month): The Great Tenna Fire in Edo. 1681 (Tenna 2): A famine afflicts Heian-kyō and the nearby areas. 1683 (Tenna 3): Tokugawa shogunate grants permission for Mitsui money exchanges (ryōgaeten) to open in Edo. 1683 (Tenna 4): Hotta Masatoshi is assassinated. In Tenna, the first book was written about the coins of Japan. The work was entitled Classified Collection of Coins (Kwacho Kuien). ↑ Nussbaum, Louis-Frédéric.. (2005). "Tenna," Japan Encyclopedia, p. 959. ↑ Nussbaum, "Reigen Tennō," p. 785; Titsingh, Isaac. (1834). Annales des empereurs du japon, pp. 414-415. ↑ Jenkins, Donald. (1971). Ukiyo-e Prints and Paintings: the Primitive Period, 1680-1745, p. 21. ↑ 5.0 5.1 Titsingh, p. 415. ↑ Munro, Neil Gordon. (1904). The Coins of Japan, p. xviii. This page was last changed on 10 December 2018, at 16:37.